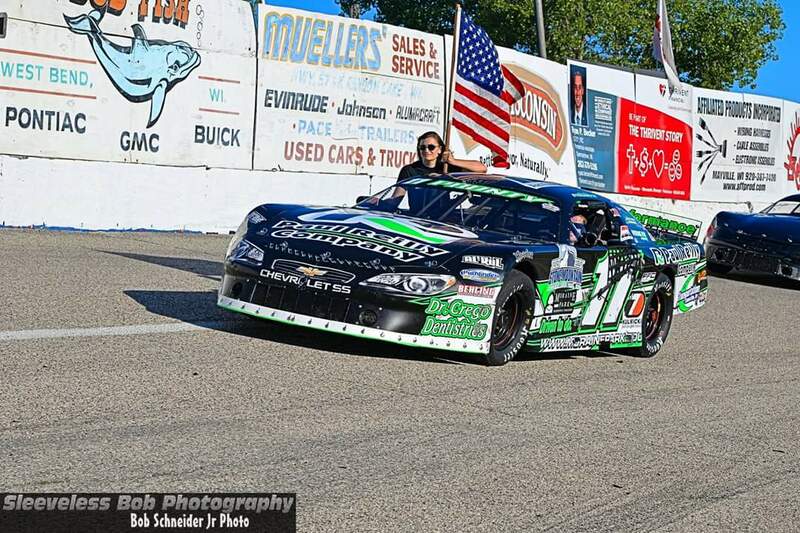 Alex Prunty Racing: Alex Earns 1st Career SLM Slinger Fastest Qualifier Award! 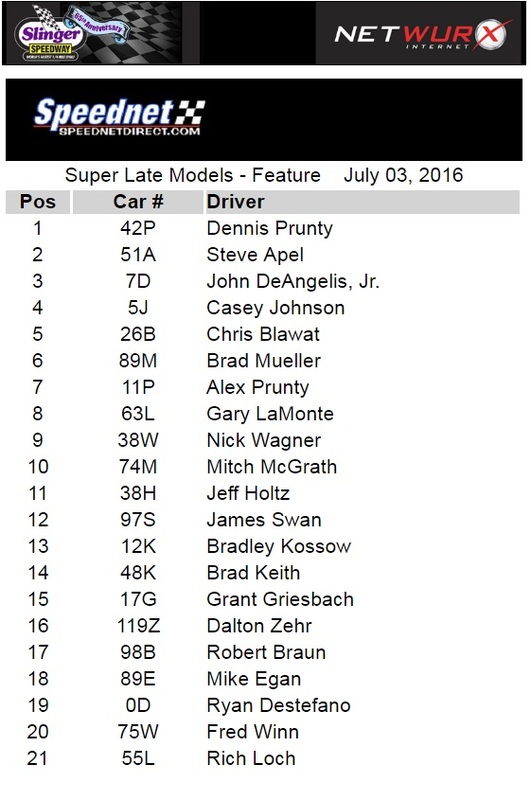 Alex Earns 1st Career SLM Slinger Fastest Qualifier Award! 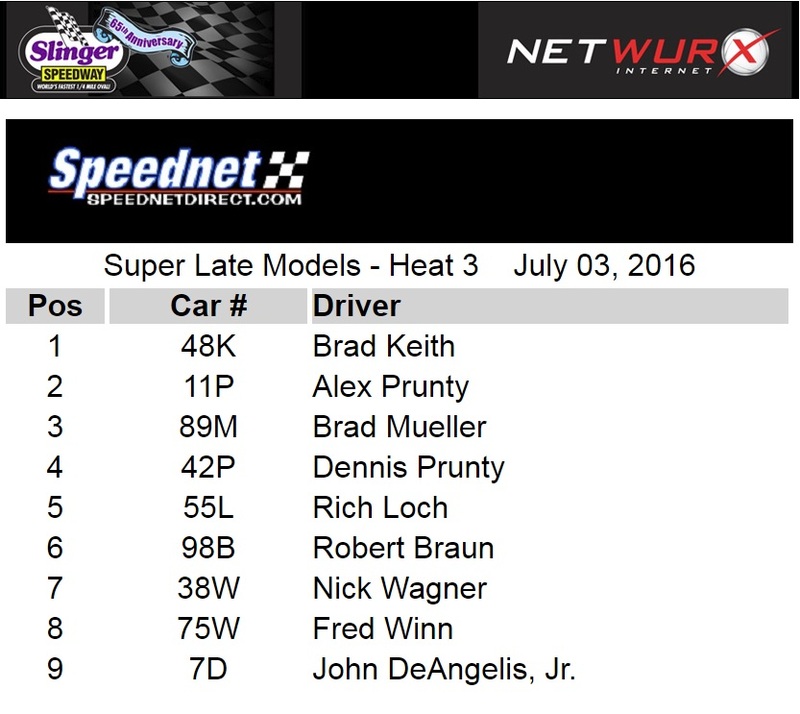 Alex Prunty set fast time for the first time in his super late model career by turning in a lap at 11.299 seconds. John DeAngelis Jr. raced to the early lead at the drop of the green flag as the field quickly fell under the caution flag on lap two when the second and third place cars of Fred Winn and Rob Braun tangled entering turn one triggering an incident that also collected Rich Loch. DeAngelis returned to the lead on the restart over Nick Wagner and Brad Keith while the outside line began to move forward and Brad Mueller, Dennis Prunty, Gary LaMonte, and Steve Apel all took advantage of the high side to grab third through sixth respectively. As they sorted out, Dennis Prunty wasted little time in first moving around Mueller for third and then Nick Wagner for second as DeAngelis continued to set the pace. As Prunty began to track down DeAngelis for the lead, LaMonte pressured Mueller for fourth as right behind them Apel and Casey Johnson gained spots after prevailing in an intense battle with Brad Keith and Alex Prunty. Dennis Prunty closed in on DeAngelis for the lead and took some serious looks to the inside of the leader just before the caution waved on lap 23 when Rob Braun’s car spun while racing with Mitch McGrath off turn two. DeAngelis chose the inside lane for the restart and Dennis Prunty used the outside lane to stay even with the leader as racing resumed. Prunty eventually ducked back in line as LaMonte and Apel advanced to third and fourth respectively. Prunty eventually worked his way alongside DeAngelis on the inside lane and took the lead after several laps of door to door racing as LaMonte closed in on the leaders from third. LaMonte then maneuvered his way past DeAngelis for second as Apel, Mueller, and Casey Johnson took over the fourth through sixth spots when Nick Wagner’s car washed high off turn four. The caution flag waved for the third time on lap 46 when Grant Griesbach’s car looped around in turn four with Prunty leading over LaMonte, DeAngelis, Apel, Mueller, and Johnson. Prunty chose the outside for the restart and he remained the leader as LaMonte couldn’t formulate a challenge with his car pinned down on the inside. Apel used the outer groove to advance his way around DeAngelis for third while Casey Johnson moved into fourth, dispatching Mueller into a battle for fifth with Chris Blawat and Jeff Holtz. While racing side by side, Blawat and Holtz ran up on Mueller exiting turn four and side contact between them sent Blawat’s car spinning into the infield as the caution flag waved on lap 55. 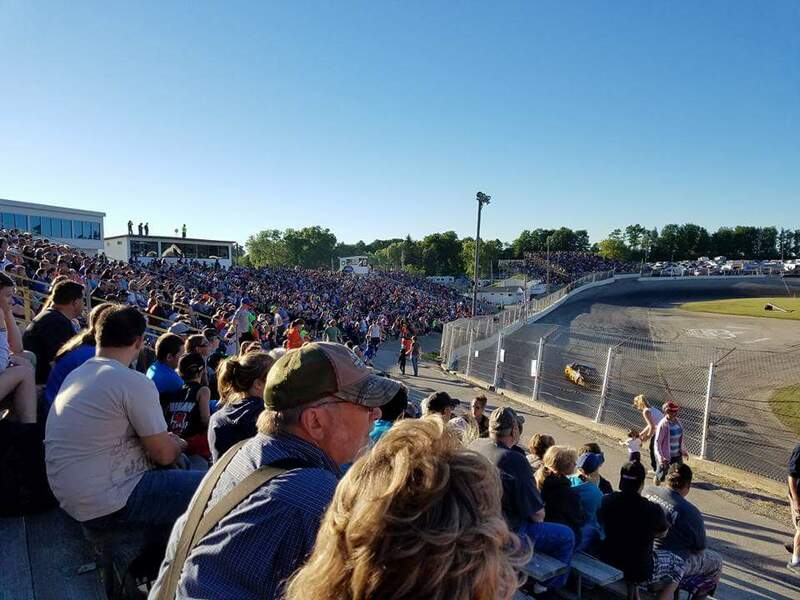 Once again Prunty charged to the lead from the outside as racing resumed while both Apel and Johnson took advantage of LaMonte not being able to keep his car glued to the inside lane to race into second and third respectively. 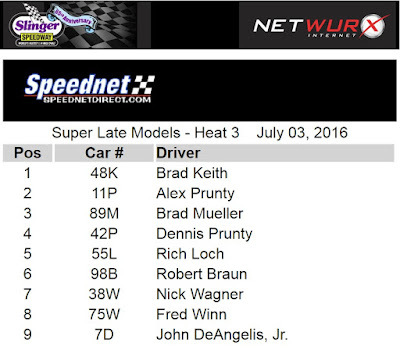 Prunty scooted away to a comfortable lead while Johnson pressured Apel for second. A tandem spin between Grant Griesbach and Bradley Kossow in turn four on lap 70 drew the caution flag and set up a five lap shootout between Prunty, Apel, and Johnson for the victory. Apel gave a valiant effort in the closing laps but Prunty was too strong from the outside and he drove to his fourth feature victory of the season. John DeAngelis prevailed in an intense battle for third with Casey Johnson while Chris Blawat finished fifth. 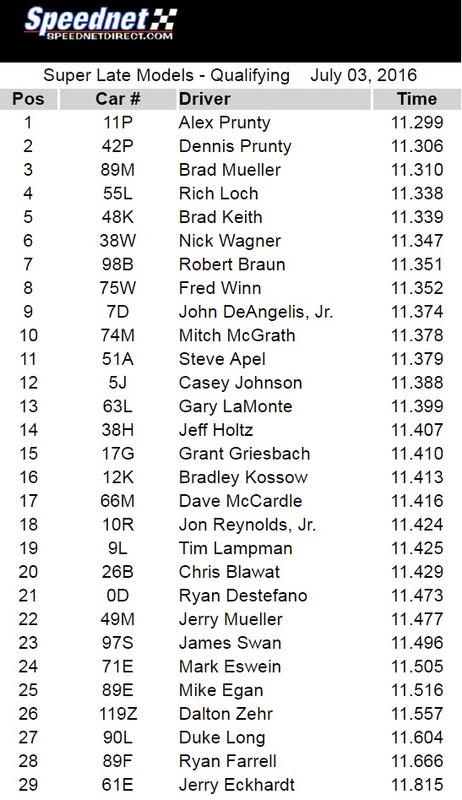 Brad Mueller finished sixth followed by Alex Prunty and Gary LaMonte while Nick Wagner and Mitch McGrath rounded out the top ten. James Swan won the 30-lap super late model semi-feature over Ryan DeStefano and Mike Egan as they along with fourth place finisher Dalton Zehr transferred to the main event. Jerry Eckhardt finished fifth. Super late model heat race victories went to Ryan Farrell, Jon Reynolds Jr., and Brad Keith and Alex Prunty set fast time for the first time in his super late model career by turning in a lap at 11.299 seconds.